Department for Culture, Media and Sport (DCMS) has committed to an ambitious long-term project that will make the Thames Estuary the world’s largest creative corridor; a world leader for the creative and cultural industries. The foundations for a Production Corridor are already being laid. There is improved transport, affordable housing, excellent education, a thriving knowledge economy and a growing hotbed of creative clusters. The region is fast becoming the engine room of the creative industries. Unique in its scale of ambition, the Thames Estuary Production Corridor will unlock long term, transformational, culture-led growth across North Kent and South Essex and establish the region as a creative hub connected to London, the UK, Europe and other global markets. It is estimated that longer term investment in Estuary’s creative industries could deliver 50,000 new jobs, adding an extra £3.1bn to the UK economy. and countless opportunities for people to engage with world class artists from here in the UK and across the globe. The creative sector – everything from music, theatre and the visual arts to gaming and film – is the UK’s fastest growing sector, generating £100bn+ each year for the UK economy, and sustaining over 3m jobs. The Estuary’s 16,000 creative businesses currently employ 46,000 people. Since 2014, the Thames Estuary’s freelance creative economy has grown by 20%. 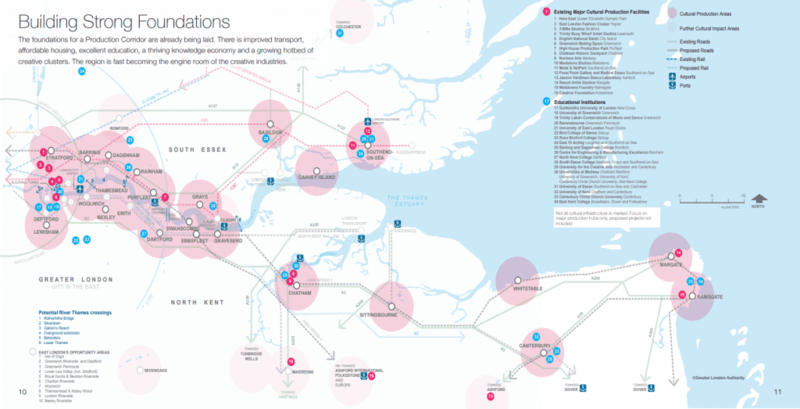 The Thames Estuary corridor is unique in its position, offering access to London markets and with land available for development. This is being recognised and capitalised on by our creative industries. This unique cross-boundary partnership was established by the South East Creative Economy Network (SECEN), a working group of the South East Local Enterprise Partnership (SELEP) and the GLA (Greater London Authority), supported by Kent County Council and Thurrock Council, who together launched with the TEPC vision in 2017. Estuary Works: New creative workspaces for creative and digital businesses in creative clusters like Margate, Southend and Chatham Dockyard.